After spotting the elephant seal in Trinidad Harbor, we decided to head home. Halfway between the harbor and home is a vista point. We stopped to take a look. It was such a welcomed surprise to see the mouth of the Mad River was here again. This river mouth moves a bit, so we don't always get to have this grand view. While we were taking it all in, we took a closer look where the river meets the Pacific. Hey, are those harbor seals lounging about, waiting for the tide to come? Why yes, yes they are! We haven't seen these beauties here in quite a while. I guess the blue sky sunshiny day had us all out...the elephant seals, the harbor seals, and the giddy humans... all enjoying the warms temps and the tide coming in. We saw this in the harbor at Trinidad, just 10 miles north of us. I thought it looked like a very large seal in distress. I actually called the Marine Wildlife Center and reported it. They told me that in warm sunny weather, like the kind we'd been having the seals like to lounge spread out on the top of the water. They said to let them know if it comes out and appears ill on the shore. Okay, I said. When we got home I downloaded the photos. I really wanted to see that seal, and if it looked like it had a green rope around it. I looked at the photo and said, "Roger, I think we may have seen a hippopotamus." He looked at the photo and said, "That's an elephant seal!" We were so surprised. We knew it looked huge, but it did not occur to us that it would be an elephant seal. This is a male lounging about enjoying the warm temps. And that green stuff that it looked wrapped in was just some seaweed. Ah, not an emergency at all, and a surprising cool creature to watch in the surf. We had just gotten back from a walk at the marsh on Saturday afternoon. It was a quiet and beautiful day out there, blue skies and warm autumn temperatures. There hadn't been much to photograph for most of our three mile walk until just around the end when we noticed this Long-billed Curlew with a damaged wing. We felt so bad for it. It looked pretty miserable with that wing hanging down. I took a few more photos and decided to go to the Marsh Information Center to see if they call Wildlife Rescue for situations like this. So, we did that and learned that they don't actually call rescue themselves. The volunteer there gave me the number, and we decided to call when we got home, which we did. 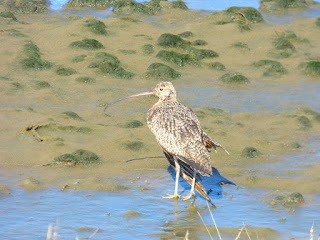 Humboldt Wildlife Rescue said that going to marsh to help birds like this is exactly what they do. The volunteer there said that she would have someone out there right away. We both thanked each other. It was great! 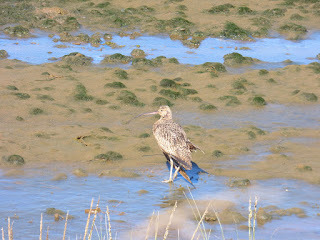 Then, I decided to download the photos I had taken on to my computer so I could see the photos of the Curlew (among the 35 other pics). I hooked the camera to the computer, saw the pics showed right up in iPhoto, as always. Then I got distracted, looked back at the computer screen and thought, "Cool, now I can disconnect the camera from the computer and delete these photos from the camera. I'm done." When I ejected the camera from the computer I deleted the photos from the memory card (yes, I took that one extra step as I always do), and then turned off the camera. I went back to the computer and saw that the photos were not there. What had I done? I had forgotten to actually click the "Import Photos" link in iPhoto. The photos were really GONE! I had never made such a goofy mistake before. I told Roger and my twin brother about my big mistake. They both said that there was probably some way to salvage these photos even from a deleted memory card. My brother sent me a link to some informative stuff on CNET, and I started looking at Memory Card readers online to see where we could go buy one. It's not like these 35 photos were really special in any way, but the thought of losing them was a bummer. On Sunday, Roger remembered that our trusty old PC laptop has a chip reader built right in! We put in the card and voila! 144 photos were still on that thing even though I had clicked "delete from memory" every time I had downloaded photos. I was shocked! So, Roger figured out how to recover and download those photos. Then came more than an hour of trying to figure out how to get those photos from the ancient PC to my very modern MacBook Pro. The USB thumb-drive wouldn't work in both formats. It was getting pretty frustrating for me, even though Roger was doing all the work! Then I had an idea. I remembered that we had a lot of never-used CDs. Roger slipped one of those discs into the PC, burned those photos on to it, and voila, we had a usable copy. I grabbed that CD and tried to put it in my new laptop and was reminded of the absurdity of the modern world... it doesn't have a CD drive. So, Roger downloaded the folder on to his old (reliable, wonderful) old Macbook Pro. I connected to it remotely and downloaded the folder. Why did we do all of this? Because we can! Because we're computer nerds! 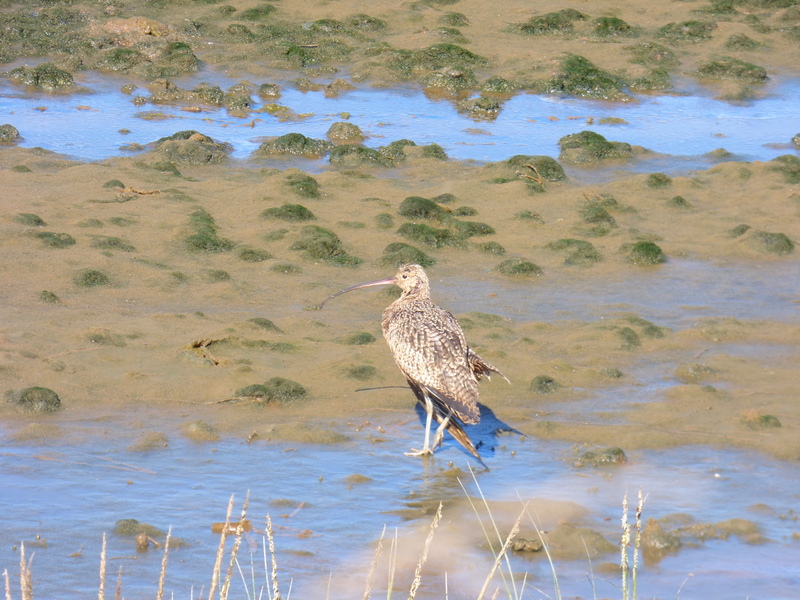 Because we wanted to show you the Long-billed Curlew with its injured wing. We hope it was rescued liked these photos. PS-- Roger wants you to know that he figured out how to get a thumb drive to work in both formats. You know we see a variety of wildlife out at the marsh. 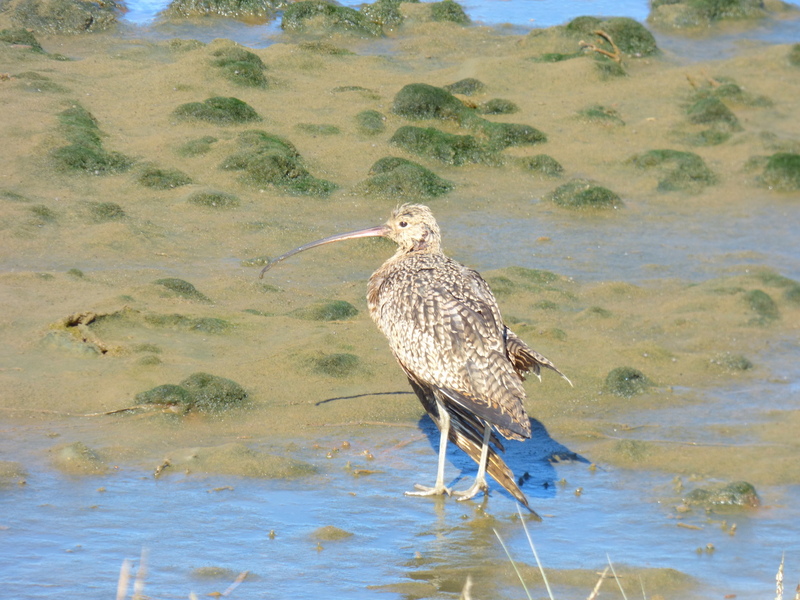 Over the years we've seen foxes and river otters, long-billed curlews and greater yellowlegs. Well, the other day we were walking on one of the trails when this young'un came up to us, pointed at my camera and asked, "Is that a camera? Take my picture." And so I did. I said to him, "Would you like me to show you the picture I just took?" He said, "Yes!" So, I showed him the picture. He said, "Take another one, and I'll smile." And so I did. We laughed and laughed. He mother said, "Okay, time to let these people move on." We never know what kind of wildlife we're going to see at the marsh! ... all the smoke cleared out and the fog stayed away. We saw the sky again after months of gray. A morning begins with Venus and the moon before sunrise. I shout, "Roger, come see Venus!" It had been so long. Is it crazy to shout hello to a planet? Maybe, but we do it anyway. We drive to the marsh and are dazzled by crepuscular rays spread across the horizon. We had never seen such a wide display like this. Is it crazy to point and dance around like kids on the marsh trail? Maybe, but we do it anyway. We look out just after sunrise to see if there are any colors to shout about. No, but there are cirrocumulus clouds spread out against a picture perfect blue sky. We stand quietly and are grateful for a moment like this. Is it crazy to just be happy about the awesome beauty of the sky? Maybe, but we are anyway! This was the post I had written for Monday (9/11). I just remembered it and thought I'd post it today. 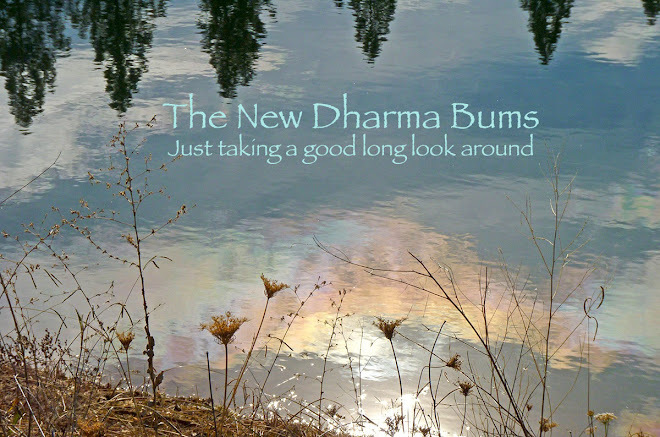 There's so much distracting craziness these days, it's hard to stay focused on the simple daily things. I hope you click on this photo. Such a web some industrious critter has created here. I love the complexity and beauty of it. It is like the wild ultimate wedding gown of webs. This is the only photo I could think of posting here to contemplate the crazy times we are living in. Perhaps it doesn't really need to be recounted, but you know... the hurricanes, fires, heatwaves, threat of nuclear annihilation, Russian meddling in our elections, and a president who is off the scales on the psycho-pathological narcissism spectrum. And then, of course, my much-loved and declining mother. It is a lot of work to try and stay sane right now, and really I'm not doing a very good job of it. This may because of my seriously overly sensitive sense of smell, which finally pushed me over the edge. About a week ago I thought I smelled a skunk very close by, so close I wondered if it might be under the house. Roger has anosmia, which means he can't smell a thing. I looked through all the little screened in vented areas in the foundation to see if I could see a skunk, perhaps stuck and trying to get out. Nope. The smell persisted for days. It was horrible. I kept looking for a sign, something that would let me know where the smell was coming from. Then, it finally began to dissipate only to be replaced by the smell of decomposition. I crouched down low and looked under the deck, so dark I couldn't see a thing. After two days of that, Roger got his very powerful flashlight and took a much better look under the deck. He said, "Yup, there's something dead under there." He grabbed a rake and pulled it out. Yes, a dead skunk, which he carefully disposed of. We think the skunk probably went under the deck after it had been injured. It was safe place to die there and mostly inaccessible. I've been burning incense and trying to reclaim some sense of sanity (ha ha, good luck with that!). 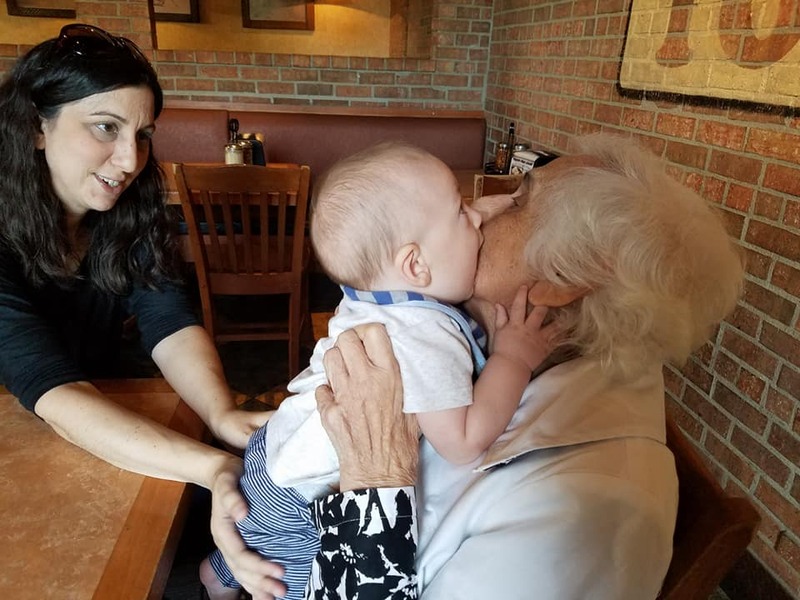 But then, you know how it is: Irma slams into Florida; the fires are still burning; anti-science crazies are in the White House; and my mother is lost in her own world of Alzheimer's. I had a different post written and scheduled to publish today, but then I noticed what the date was. I thought about writing something new, but decided to just re-post this one from a decade ago. All of the comments on that post are gone because we were using a different commenting platform called Haloscan at the time, and they went defunct in 2009. So, if you'd like to share your memories, we would love to read them. When I re-read this post I realize how grateful I am that I wrote it because, seriously, I could never remember these details or write this again. What a day that was. On September 11, 2001 Roger and I woke in a cabin in Sierra City, Ca. The phone was ringing in our room. It was the first full day of our vacation. We had left Santa Cruz on Sunday afternoon September 9th and driven 250 miles to Truckee, Ca where we spent the night, and the morning drove the back roads to Sierra City. 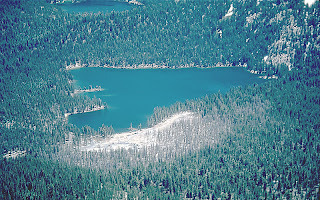 Our plan was to get there some time on the 10th, maybe do an afternoon hike, but to start our hiking vacation in the beautiful Lake Basin on the 11th. Our cabin had a full kitchen and bath, a TV with satellite, a telephone. We didn't have cell phones or a laptop. Primitive by 21st century standards. I had given our travel plans to my mother and my sister. They always know where we are, and we talk everyday no matter what. So even though we planned to be essentially out of touch, we were not out of reach. First green heron we've ever seen. Definitely click on that screen shot and take a look. It doesn't mention our crazy weather at all, it mentions the smoky air that has enveloped us for days. There are fires all over the mountains to the north, east, and south of us. California is burning. Our prevailing winds are usually onshore, but for the past few days they've been blowing from the east and bringing with it hot, smoky air. This is what the marsh looked like on Saturday at 6:00 pm. This is the air we were breathing when we went for our walk. It was an hour and a half before sunset, but the sun was hazily lit by the smoke, and filled the incoming tide with sunset colors. We actually headed out to the marsh to see these colors. They are breathtaking, literally and figuratively. Interestingly, when we arrived back at the parking lot after our walk, it was full of cars and people sitting on the hoods and roofs, watching this display. It's always good to find the beauty even in the crazy smoky skies of California. By Sunday our heatwave had diminished a bit. We're still under unhealthy smoky skies, but we're making the best of it. We are not in danger from fires in any way, unlike a lot of people we know and love. Ah, California summers.